Being confident in one’s sense of self is a noble goal. Even for the most introspective of people, achieving self-confidence is a lifelong pursuit. But you don’t need to be a Buddhist monk or philosophizing hermit to reach this desirable state of inner being. With a little bit of work, you can easily get there. How? By training the Wise Mind. The Wise Mind is a rare psychological state that a person occupies in their day-to-day life. It is the quiet, optimal mode of acting/thinking that is flexible, adaptive, and holistic. Success and confidence flows out of this mental state. The Wise Mind sits in the middle of two extreme ends, the emotional mind on one end and the rational mind on the other. Most people find themselves on either end of the spectrum, being either overly emotional or overly rational in their decisions and behaviors. The middle, however, often gets skipped over. Building confidence and quelling self-doubt happens not on the ends, but smackdab right in the (Wise Mind) middle. Unfortunately, your default psychology is working against you as the brain likes to sit at the two ends and to miss the centre point altogether. But the good news is, you can learn to override this default response and cultivate middle-of-the-road wisdom. It’s a matter of applying a tactical habit-based set of exercises, which we provide in the framework below. As always, our team of psychology and neuroscience PhDs have scoured scientific research, giving you the utmost confidence that the recommendations are based in evidence. You have the very natural (though unfortunate) human tendency to operate from a place of pure reason and/or pure emotion. The explanation for this, researchers now know, comes down to how the brain is structured, in particular the separation of its “old” and “new” regions. The evolutionarily “old” brain is what we share with most other animal species, and often goes by the term “reptilian brain.” It’s deep within centre of the brain, in an area called the limbic region. It is the seat of raw, instinct-based emotion. The evolutionarily “new” brain is uniquely human. Residing in the area called the prefrontal cortex, this spongy fold of brain tissue lying just beneath your forehead is disproportionately large compared to all other animals (25-50% greater total volume). It is the seat of cold, calculated reason where planning, reasoning, and executing happens. There is a fundamental “age gap” between the old and new brain. The former evolving half a billion years ago, and the latter a mere couple hundred thousand years ago. Because of this, there are few connecting neural networks that run between the two regions of the old limbic system and the new neocortex. Take a look at the brain map below. This is called the human connectome brain image. See where the arrow is pointing in the image? This is the structural separation between the old and new brain. Neocortex on top, limbic subcortex on bottom. As you can see, the connecting hubs and tracks are far more dense within each region than they are between. In other words, the old brain and new brain don’t talk to each other very much. So you can’t help but be purely emotional or purely rational. You’re wired up this way. The biological design of the brain is meant to operate separately in either one of these two modes. But there is good news. Despite this “hardwiring,” the brain is highly malleable. The connections between neurons and the tracks that form between different regions in the brain can be built, altered, changed, and rejigged. Brain structure and function is never rigid or fixed. This idea, called neuroplasticity, tells us that the Wise Mind is created out of changes in neural structuring that connect the old and new brain areas. By implementing the right kind of behavioral tactics and habits, you build new connections and strengthen existing ones to open up the lines of communication between the two brain regions. The science is clear on what happens when these connections get made. Research shows that people whose brains show more integrated neuronal connections with a balanced blood flow activation between these different brain regions experience less sadness and depression. They also show a greater global network efficiency, which leads to higher cognitive functioning and fluid intelligence. Newly instated behaviors reinforce the grooves and create a much needed middle zone for the Wise Mind to occur – and with this, you avoid the all-or-none “purely emotional” versus “purely rational” mode of action. You resolve the polar opposites in coming to a point of dialectical integration: You become the Wise Mind. Let’s walk through each in turn. An ability to observe all your emotions regardless of their source/type, and to have the experience without getting caught up in them (side note: this is the idea called equanimity, which comes from Ancient Buddhism and, like the point before, has become the topic of research in contemporary psychology research). It is the harmonious balance of thought/action that resides between the emotional mind and rational mind. It is the perfect blend of sensing/feeling and thinking/analyzing. It arises from a deep-seated intuition in which you’re able to know and understand the significance of an event without i) submitting it to deep intellectual analysis (rational mind) and ii) having it be swayed by sweeping evaluations (emotional mind). Outside the “middle zone” lay the opposite extremes of the emotional mind and rational mind. The next step is understanding what these look like so you can notice when they’re happening and avoid them moving forward. A commonly cited example of a dialectic involves a child growing up. In the beginning the child shows complete obedience to his/her parents (one extreme end, or the thesis). In time the growing adolescent will begin to do the opposite in order to gain adult independence, eventually becoming rebellious (other extreme end, or the antithesis). But he/she can only become a fully functioning adult (the truth) by moderating this rebelliousness and avoiding the initial obedience. At this point the dialectic is said to be resolved (the middle, or the synthesis). Rooted in the Socratic tradition of ancient Greek philosophy, dialectical thinking was recently transformed into a form of therapy called Dialectical Behavior Therapy, or DBT. 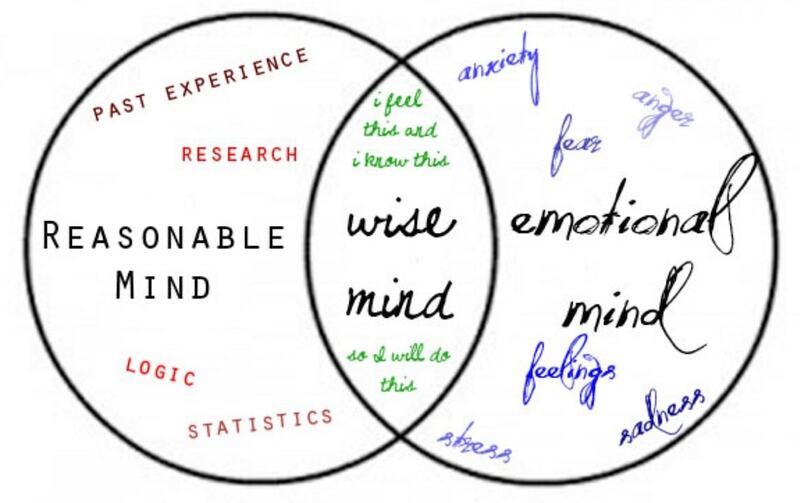 Wise Mind is a direct application of DBT, which has been proven as a unique and highly effective intervention-based strategy (in some cases improving people’s emotion-related problems 80% of the time). As with any dialectical thinking, synthesizing the middle path (Wise Mind) happens only when you can notice, observe, and integrate the opposite ends (emotional mind versus rational mind). You therefore need to know the features of either extreme. Do your thoughts and behaviors feel like they’re happening on autopilot? Are you acting with very little deliberation or conscious effort? At its worse, do you feel you are being impulsive and reckless? Answering yes to these means you are operating primarily System 1 processes and “deciding” with a certain level of nonconscious immediacy. These are hallmarks of the pure emotion arising out of hyperactivation of the limbic brain region. Are you taking certain facts or data and attempting to fit it into what you would like to happen, or what you would prefer? Answering yes to this means you have a mental blind spot called confirmation bias. The byproduct of an emotional mind, this bias is the tendency to search for, interpret, favor, and recall information in a way that confirms your preexisting beliefs. Do you feel that your subjective opinion is all-encompassing and absolute in its personal significance? Answering yes to this means your experiences are being processed as emotionally-based generalizations that are personalized, stable, lasting, and even moralistic. Do you feel your inner state and outer actions are difficult to control or override? Answering yes to this means your limbic system is working on overdrive and not receiving the inhibitory signals from the prefrontal cortex, the region of the brain responsible for controlling and overriding our automatic emotional impulses. Does your thinking/behaving feel deliberate, done with careful consideration and foresight? Are you not deciding until all information has been gathered? Answering yes to this means you are operating primarily System 2 processes, resulting from a hyperactivation of the neocortex in the brain’s prefrontal region. These processes are known to slow down decision-making and intuitive judgments. Do you find yourself adhering to any and all the facts that you come across and ignoring anything not considered factual? Answering yes to this means the hyperactivation of your prefrontal brain regions is biasing you to pay attention towards certain empirically based information, and away from anything intuitively grasped. Are you making decisions based only on observable, external information, and not based on anything derived from internal states? Answering yes to this means you are muting activation in the emotional limbic system. This system is responsible for the visceral, body-based cues that improve decision-making, what researchers refer to as the Somatic Marker Hypothesis. The hyper-rational mind is shut off to these bodily signals, leading to suboptimal decisions and behaviors. The basis of the issue with low self-confidence is that your brain causes you to flip-flop between the two extremes. It happens like this: For a period of time, you let your emotions run the show, which leads to unrelenting uncertainty and personal doubt. You grow tired of the impulsivity and the issues that it leads to (both within yourself and in your relationships), and so you decide to “turn off” the emotional mind. You then do 180-degree switch to the rational mind. At first, you feel more grounded, less at the mercy of your emotions. But in time you realize that the cold, robot-like mindset also has its limits. You are slow to act. You get bogged down by the unending search of best-case-scenarios. You begin to feel separated from your true sense of self. The lack of personal confidence returns despite your best intentions. This results in a mental state of negative feeling, which propels you back into the emotional mind. And so on, and so on. Round and round it goes, alternating between the two extremes, skipping over the middle each time. The goal then is to stop this back-and-forth switching, and to find the middle sweetspot. The following tactics and solutions will help you do just this. They are a set of brain-training exercises that foster neuroplasticity while building up the much-needed connections between the “old” and “new” brain areas. Solution 5 can be applicable in either case. The distraction techniques are an effective first-step as you begin laying the tracks of the Wise Mind. These are best utilized when you notice you’re knee-deep in the emotional mind, and feeling the intensity of self-doubting emotions. When the limbic region (the “old” reptilian brain) is hyper-activated, often the best course of action is to turn down the signals just for now. The following tactics act as short-term “quick fixes” that serve to temporarily break you out of an emotion trap. They’re meant to snap you out of an emotional state, while simultaneously strengthening and training the Wise Mind. A good way to remember this is: This way of being ACCEPTS. Distract with Activities: Choose an activity that is body-based and requires at least some minimal amount of physical movement. Could be as simple (and mundane) as picking up a newspaper or magazine and circling all the pronouns (“she”, “it”, “hers”, etc. ), or doing 10 minutes of a crossword. Or it could be going for a 5 minute walk around the block or office. Or cooking a meal for yourself. Distract with Contributing: Do something nice for someone else. It doesn’t need to be any sort of big, grandiose gesture or gift. You can simply smile at someone, mimic their movements, buy an extra couple cans of food and put it in the donation box at the grocery store, hold the door for a group of people, allow a person to go ahead of you in line. Helping others injects a little bit of positivity to reorient the brain’s processing of negative stimuli in the limbic region. Distract with Comparisons: Think about the self-doubting emotions you’re experiencing right now, and recall a past moment when you felt similar. Ask yourself: Have there been moments when you felt just as much negativity and self-doubt, but were actually less equipped to deal with them? The point here is to tell yourself that you have more skills now than you did then. Distract with Emotions: Whichever emotion or physical state you’re currently in, do something that will quickly put yourself into the opposite state. If you’re feeling tired, listen to energetic music while you work. If you’re feeling sad, watch short clips of stand-up comedy on YouTube. This idea is referred to as the Law of Concern in emotion science. Distract with Putting away: Consciously tell yourself to put away those negative emotions, just for now. You’re not trying to put away or push down the self-doubts indefinitely (this is actually impossible, psychologically speaking, and harmful in the long-term). Rather, you are making the choice to come back to those concerns at a later time when your limbic zone isn’t so fired up. Distract with Thoughts: the mind is incredibly good at thinking up thoughts. It happens naturally. Knowing this, try inserting some new thoughts for 10 minutes. Watch a recommended video on a YouTube channel. Read a blog post from your favorite media site. Read one from least favorite site. Or, try explaining to yourself a mechanistic process of how something works. For example, how does a tree utilize photosynthesis? Distract with Sensations: Shake up the brain’s activations by experiencing a startling (but harmless) sensation. Hold onto frozen bag of vegetables for a few minutes, take a cold shower, etc. Even try eating something you hate the taste of, or smell rotting food around a garbage. A sudden stimulation of the senses recruits different sensorimotor regions in the brain, thus deactivating amplified processing in the limbic region. Emotions aren’t the enemy. Part of the reason why you flip-flop between the two extremes is because you believe that feeling certain negative mood states is bad for you and your self-confidence. You have to challenge that assumption as part of training the Wise Mind. Emotions themselves aren’t inherently bad. It’s your reaction to them that causes all the problems. While our first solution of distraction works for in-the-moment fixes, this solution is much more long-lasting and sustainable. For that reason it’s best applied in the moments when you feel you have somewhat of a grasp on your emotional mind, but feel you need a little push to edge you over into the Wise Mind state. Rationalizing your emotions happens by becoming reacquainted with them – to learn about what they are, how and when they arise, why they happen, etc. You need to know that your emotions are there for good reason. You’re no longer distracted as you were in Solution #1. Now you’re engaging and facing them head on. Step 1: Describe the emotional event: First, find the prompting event that has led to a particular emotion. This can be either internal (e.g., a thought or a memory) or external (e.g., a situation outside yourself). Every emotion starts with some type of prompting event. And there may be more than one. Next, find how you’re interpreting the emotion. This isn’t the actual emotion or the feeling, but rather the inner dialogue you’re having with yourself. It’s usually an evaluation of some sort (e.g., “I don’t like this; I like that”), and it tends to happen outside your conscious awareness. Your job is to bring it to your consciousness. Finally, give a label to the emotion that you’re feeling. Be as specific as possible. Don’t just say happy or sad. Go deeper. Consider emotions like guilt, shame, pride, disgust, agitation, regret, and so on. The ability to be specific in emotional labeling has been shown to lead to a host of positive mental outcomes. Bodily action: You should have a visceral cue of how the emotion feels in your body. Look for the classic signals including clenched fingers/toes, hunched shoulders, flushed face/torso, deflated and hanging limbs, blurred vision, etc. The idea here – called “action readiness” – is that our emotions are meant to prepare us to engage in some type of adaptive action. Communicate or express: You should have a natural urge to express or communicate with someone, either verbally or nonverbally. If you’re in a social context, notice what you’re doing with your face. Are you furrowing your brow? Pursing your lips? Raising your eyebrows? And also notice what you’re doing with your body. Are you leaning in? Leaning away? In a closed-off stance? And in terms of verbal, notice the tone you’re using – is it hostile? Calm? Staggered? Rushed? Hyper-rational thinking is appropriate in contexts that are highly certain, and where all the facts can be reliably gathered to inform a future decision. The thing is, most situations in your day-to-day life aren’t like this. Rather they are full of uncertainty and unknown possibilities. The more effective alternative in such uncertain environments is to apply intuitive style thinking (or sometimes called heuristic judgments). The Wise Mind relies on the power of intuition. It knows when to apply intuitive style thinking. Follow these steps to assess when you should turn down your rational, deliberate thinking and turn up the wisdom of your intuition when things are bit uncertain. 1. First, start off by monitoring the situation you’re in. Hone in on the one particular aspect of your behavior or decision that is demanding your attention at this moment. The extreme ends of our mind tend to create a “spillover” effect in times of uncertainty, which can quickly lead to the flip-flop between pure rationality and pure emotionality. Ignore the outside noises and focus on one thing at a time. Assign a predictability score for what you know based on a. and b. Write from 0 (not predictable at all) to 100 (completely predictable). 3. Look at the cut-off scores to determine whether you should ramp up your reliance on intuition. Rare case: If you have lots of data (>70) and few parameters to estimate (<30), the situation is predictable and relatively simple. These rare cases where you know lots about the situation can rely on pure rational thinking. Much more common case: If you have very little data (<30) and lots of parameters to estimate (>70), the situation is unpredictable and complex. These are the times where the rapid intuition style judgments will elicit a Wise Mind state. It’s in these times where you should avoid over-thinking and the all-too-common “analysis by paralysis.” Instead, rely on those gut-level hunches. At first, this exercise will require more of a concerted effort to determine when it makes most sense to turn off pure analytical reason. But eventually it will become second nature to you. You’ll just “know” when it’s best to get out of the hyper-rational mind and instead rely on the wisdom of your intuitions. Once you know when it’s the best time to occupy the Wise Mind, the next is to actually start exercising the intuition muscles. A great time to do this is when you have to make a particular decision. Specifically, when you are required to choose a single option from a list of many possible alternatives. At first, many entrepreneurs and business leaders will default to “analysis mode.” But when you’ve decided that the context is uncertain (which is most often, see Solution #3) it’s much better to apply intuitive tactics. The most effective and simplest tactic being the take-the-best heuristic. There are three aspects to the heuristic/intuition: search rule, stopping rule, and decision rule. First, consider all your alternatives. Are you faced with a situation in your business or work where you have multiple alternatives and can create a list of possible options? This is the search rule. Then, settle on a single attribute or feature that you believe is most important in arriving to your decision. How do you choose? This one feature should best discriminate between the options that came from the search rule. For example, if choosing which marketing channel to go with (and there are multiple possible alternatives), you perceive there’s a single attribute that is best able to discriminate between the alternatives. Let’s say this attribute is ‘how well the channel scales’. Of all the alternatives, there’s one in particular that shows the greatest amount of scale. This becomes the single “best” reason. Take this and ignore all other cues or attributes. This signals the stopping rule. If you find that no other attribute or feature can do as good a job at discriminating between all the options, then that is the decision you go with. This signals the decision rule. A decision-making context like this one will help train the Wise Mind and build defense against the default of pure reason. This default strategy, called the additive linear model, steers you in the wrong direction by giving unwarranted precedence to reason and analysis. In the linear model, you would compute the sum of all attributes/features multiplied by the relative weighting, and then choose the option with the largest final sum (note: you do this naturally, without actually doing any math or calculations). People get fooled into taking this approach because it is more logically complex and, therefore, “feels” like it is the more correct and comprehensive strategy. But decades of research suggests that intuitive style thinking (like the take-the-best approach) is quite often the better option to go with. And the benefit is that, training the Wise Mind in this way will give you greater confidence in how you make decisions in your business and personal life. Training the Wise Mind doesn’t necessarily feel good in the moment, though it clearly has lasting long-term benefits. The opposite is true for the emotional mind and rational mind. They feel good in the moment but are clearly bad for us in the long-term. What is adaptive, or “good”, for us in the short term is often maladaptive, or “bad”, for us in the long-term (and vice versa). More often than not, the brain makes decisions for what is good for us now, not for what will be better for us later. Done? Okay. Now look to what you wrote. Not the content or the subject matter, but the time frame. Were you thinking about Bill in terms of later in the day? Later in the week? Or years down the road? A truncated time horizon (categories 1 and 2) is evidence that you have a restricted range of temporal attention. And this means you’re particularly prone to occupy the emotional/rational mind, and less likely to find yourself in the Wise Mind state. In fact, many of the deep-seeded psychological problems faced by people stem from this restricted temporal attention: addictions, compulsive behaviors, bad habits, anxiety, and of course, a lack of self-confidence. In fact, researchers found that in response to the Bill writing prompt you just did, that heroin addicts considered futures of only 9 days, compared to normal non-addicted individuals who projected stories an average of 4.7 years into the future. Future time estimation: At regular moments in your day-to-day, ask yourself and ponder over the estimates of moderate-to-long time windows. For example, research has shown that simply asking time estimation questions naturally elicits a broader time horizon. Questions like: How long would it take to learn a language? To learn a new instrument? To remodel your home or office? Past time recollection: Similarly, use episodic reflection to recall past events. But not any past situation. Instead, remember back certain events that have a memorable past but require more effortful recollection in your mind. Some good examples include: When was your first cavity? When was your first car license test? When was the last time you got a haircut? These time estimates and recollections will place your psychology under longer time horizons so that you are able occupy the Wise Mind state. The Wise Mind is the optimal state for true self-confidence. It is the strongest defense against the crippling pressures of doubt and indecision. The more you occupy this optimal mental state, the better off you are. You’ll be less distracted and act with a self-assuredness that can help you get things done effectively and efficiently, and with greater sense of personal meaning. Recognize the defining features of the Wise Mind state and know what to look out for. Monitor your behaviors and cognitions to notice when you’re occupying either extreme emotion or extreme reason. Apply the 5 solutions to train the Wise Mind and learn how exactly to move away from the extreme ends and instead settle on the middle.